The VWR Hybridization Oven 230502V offers you dependable heating and stability, with consistent and effective mixing to meet your hybridization and incubation needs. This compact incubator has a rotisserie rotator that holds between 4-8 bottles, depending on size and configuration, and operates at speeds between 5-60 rpm. The incubation portion of this hybridization oven is built for rapid heat up and reaches a max temperature of 75°C. The VWR Hybridization Oven 230502V is a great choice for medium capacity needs, without sacrificing a lot of bench space, and its quiet operation means it won’t be a distraction to the work environment. This VWR Hybridization Oven 230502V has been fully inspected and is operating without issue. 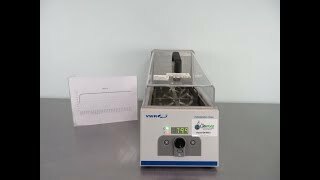 All of our lab equipment comes backed with our standard warranty. Should you have any questions, please don't hesitate to contact us.